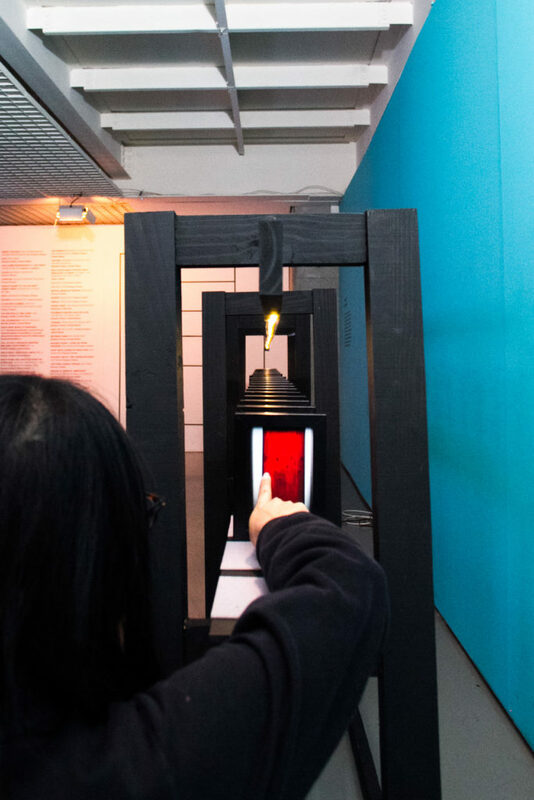 “Domino” is an installation which consists of a mechanism that produces a Non-Stop Stop-Motion video and its screening. Non-Stop Stop-Motion is a new animation technique in which a video camera continuously films a motion change illusion, in this case a Domino fall, caused by the stop motion properties of its setting. The final video has intermittent movements similar to a typical stop motion video but the audience can also watch what happens in between the frames of the video and combine the space of the narrative with the actual space. The rate of a typical domino fall is 28 bricks per second. This is very close to the video frame rate (25fps). Every domino brick is the drawn frame of a video; when the first falls, the second is revealed; when the second falls, the third is revealed, and so on until all the frames fall and the illusion of movement in the narrative’s space ends. The sound of the fall supports the illusion and gives the impression of steps in the narrative’s space. Anna Vasof is an architect and media artist. Born in 1985, she studied architecture at the University of Thessaly (2010) in Greece and Transmedia Art (2014) at the University of Applied Arts in Vienna. Since 2004 her videos and short films have been presented in several festivals, some of them winning prizes. She is currently working on designing and building innovative mechanisms for producing critical and narrative videos, actions and installations.